A short note today, focused on demand for coal. We all wish the coal industry the best, and we are all grateful to Representative Cheney for her work to make life easier for our state's coal industry. Lifting regulations on private-sector economic activity is inherently good. At the same time, the long-term trends in coal consumption are no source of optimism regarding the future of coal. In this context it is important to understand some proportions. Coal exports is insignificant to total U.S. exports - worth approximately $400 per $1,000,000 of exports on a long-term basis - but its growth rate compared to total exports is a good indicator of economic activity. 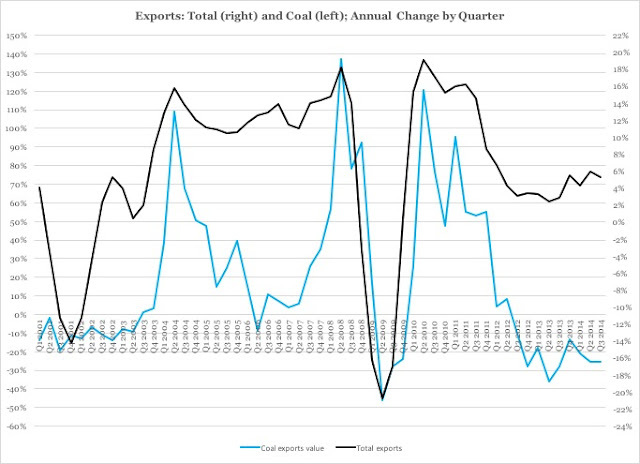 During the growth period in 2003-2007, total exports grew steadily at more than ten percent per year, on average; growth rates in coal exports were higher (left axis) but far more volatile. A similar pattern emerges after the Great Recession, 2010 and on, only this time coal exports actually decline while exports in total continue to grow. The implication in this is that while world interest in American goods and services grow - albeit at comparatively modest rates - the same world is much less interested in American coal than it was before. 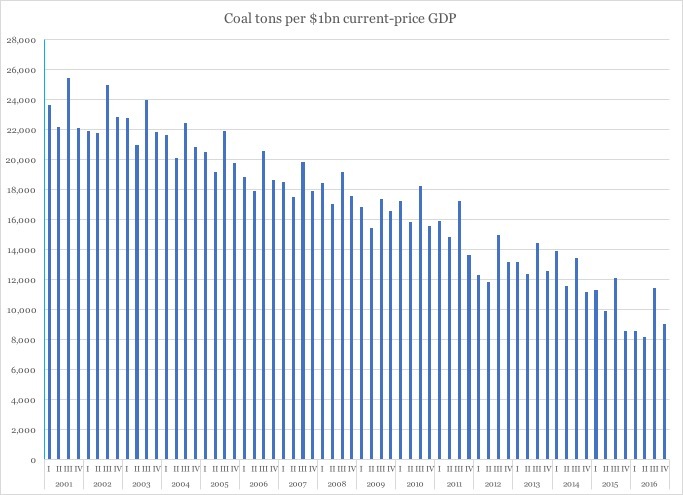 This decline in relevance of coal for fueling the American economy is long-term in nature, preceding Obama's "War on Coal" by at least a decade. Coal is a valuable resource for both energy production and other industrial purposes. Its use should neither be subsidized nor penalized by government. The long term trends presented here suggest that even if government gets out of the way of the coal industry, we here in Wyoming should not count on our primary natural resource to keep fueling (no pun intended) our state government. What Professions Lose Most Jobs? What Caused Recent Rise in Coal Production? Wyoming! Wake Up and Smell the Coffee!